60 mph on a motorcycle feels _so_ much faster on a bike than in a car. Bumps in the road have a bigger impact on a motorcycle. A windshield is an amazing thing, in terms of changing your driving experience. My motorcycle doesn’t have one, and it can feel like I’m going to be blown off my bike. Turn signals don’t automatically turn off on my motorcycle. I have to explicitly check to make sure I’m not THAT annoying driver. 35 degrees (temperature this morning) is remarkably cold when driving 60 mph. Motorcycles don’t have glove boxes or other such handy places for leaving things at your vehicle. That rock that might put a ding in your windshield leaves a pretty nice contusion when it hits your unprotected shin instead. There are no windshield wipers on motorcycle helmets. Biggest lesson: still a whole lotta fun. I’m not looking forward to tucking it mostly away for the winter. Thinking maybe I’ll try doing some skills practicing at the local high school over the winter – low speed controlled turn maneuvers and such…. I’m also looking forward to kitting it out with some sort of carrying bag and doing an overall general tuneup and chrome detailing. Went to try my first big adventure drive to work the other morning, and my bike wouldn’t start. Grrrrr…. Pushed it back up the driveway and headed in in my Toyota. That evening, went to go figure out why… Symptoms: it did that morning, and then I cut it off so that I could move it down the driveway without the loud engine noise, and just start it back up again to pull out. When I tried to start it again, it just made a whirring noise. The oil light came on and my neutral light was on because, of course, I had it in neutral so it wouldn’t jump accidentally. Since it had started once, I was hopeful that there was some sort of moisture issue in play or that I’d flooded the engine. Either one should have resolved by the evening. Unfortunately, same symptoms, though now the lights looked a bit dimmer. Theory: I needed a jumpstart. Now – where’s the battery? Turns out it’s under the seat. Which can be gotten to using the toolkit that’s locked away under the left side panel. Which requires me to remove the left panel to then figure out how to remove the seat. Long story short: after removing the seat, jumping the battery, taking out the battery, getting a new battery (thanks, hubby! ), and then figuring out how to get new bolts (since in taking out the old battery, I apparently lost the bolts on the screws to hold in the battery), I’ve accomplished my first motorcycle repair! Saturday of a 3-day weekend… We thought we were sneaking to the dealership to look at a bike and then head to the Ren Fest. Instead, brought home a different bike than the one I went in to look at. Meet my 2012 Honda Shadow… She doesn’t have a name yet, but she’s definitely a she. 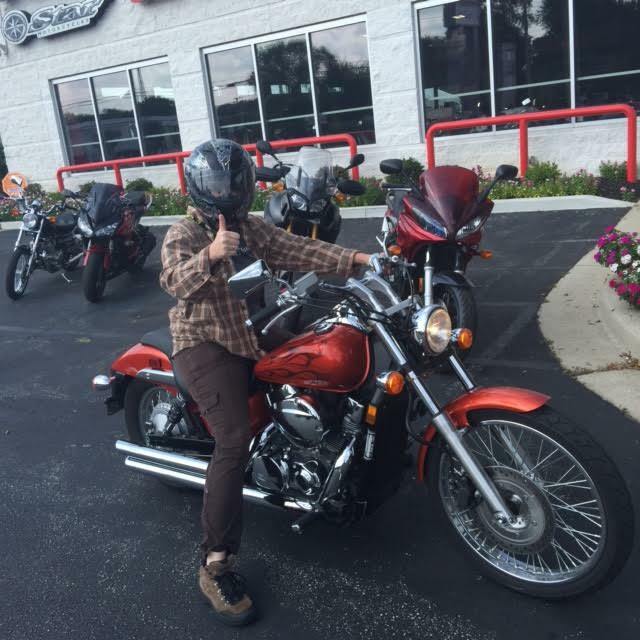 Now, this picture shows me confidently holding up a thumb for the sales guy to take a picture as I drive her off the lot. That happened, yes, but the drive was only as far as the next door parking lot. I’m not brave enough to take her out on the highway yet. Later in the day, my brother-in-law was kind enough to come back with me and drive it home. Since this weekend was a long weekend, I got a bit more time to go play.. Sunday afternoon and Monday evening both had me tooling around the local high school parking lot, seeing if I could put her through her paces. As I remember from the class, right-hand turns are harder for me for some reason. I’ve stalled out at several stop signs, and the U-turn is still a hit-or-miss endeavor. But that’s what practice is for. Since I need to make a left-hand turn out of the high school to get home, and that light’s sensor doesn’t register that I’m sitting there, I’ve had to drive a bit further on the roads in my town that I’d otherwise anticipated. Mild panic when I need to stop at the bottom of a hill and keep my 400+ lb girl from nosing out in traffic while avoiding stalling her so I can make the jump across the lanes to make the left.. I did let my hubby jump on the back of the bike this evening, just long enough for a loop around the school parking lot. We drove all of 15 miles per hour – haven’t asked him yet if his heart’s stopped pounding…. Motorcycle dreaming… I have this image of me on a cruiser, feet out slightly in front of me, riding down the road. The road isn’t crazy, but it isn’t an empty country road, either. Have had this dream for a good long time. Long ago, I did my first bit of dream fulfillment, buying a black leather motorcycle jacket at a yard sale. I’ve checked out bikes in parking lots and in magazines while waiting for haircuts. I’ve ridden on the back of bikes, and have a brother-in-law who was gracious enough to let me drive his bike around his apartment parking lot. What I haven’t had is a license and my own bike. This week, I started to correct that. On my birthday, I started my first day of a 4 day motorcycle class. Tomorrow I get to move from classroom to driving range. I’ll happily get up early on a Saturday to get a chance to advance this dream. I’ll be on a Harley Davidson Street 500… not thinking this is my dream bike, but I’ll happily learn on it for a day or two. Can’t wait to see what the weekend holds, and where my heart and brain are re: motorcycles by Sunday…!